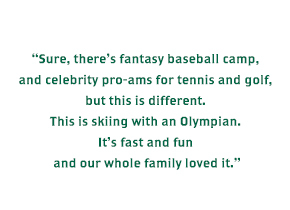 Deer Valley Resort’s Ambassador of Skiing, Heidi Voelker, invites you to ski with her or one of six other Olympic snowsport athletes this winter. Our athletes are available to ski with individuals, families and groups for exclusive half- and full-day memorable adventures at Deer Valley Resort. Heidi began skiing at the age of 2, chasing her three older siblings through the ski areas of the Berkshires in New England. Possessing a great skill for the sport, she launched into competitive skiing at a young age, earning silver at the World Junior Slalom (1987) and receiving the Junior Alpine Skier of the Year award (1988). As a 12-year veteran of the U.S. Ski Team (1985 to 1997), Heidi has many titles as a competitive ski racer: she holds six top-10 World Cup finishes to her credit, including a third place finish in 1994, and competed for gold during three Winter Olympics. Heidi was also the 1994 National Champion in Giant Slalom and finished her illustrious racing career with a third place finish in Giant Slalom at the U.S. Nationals in 1997. She moved to Park City, Utah in 1990 and has been skiing for Deer Valley Resort since 1995. Kaylin, a four-time National Alpine Champion and 10-year veteran of the U.S. 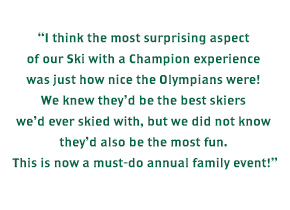 Ski Team, competed in the 2006 and 2010 Winter Olympics. After retiring from the World Cup in 2010, Kaylin became a big-mountain skier and won the Freeskiing World Tour’s North American Championship in 2012. She has been featured in six Warren Miller films, including this year’s Line of Descent. 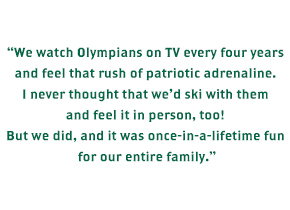 Jillian is a two-time Olympian and 13-year member of the US Freestyle Ski Team. She is known for her extensive success in the mogul and dual mogul events, as well as, being the only woman to perform the Cork 720 in the Olympic Games. Jillian brings a unique sense of excitement to the mountains with her effervescent personality and positive nature. 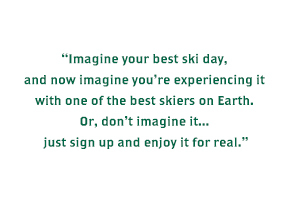 Skiing with Jillian will introduce you to a new winter experience, you have yet to enjoy. In addition to coaching the 1998 U.S. Winter Olympic Aerial Ski Team, Fuzz competed in three Olympics and numerous World Championships. Recently elected to the U.S. Ski and Snowboard Hall of Fame, he is widely recognized as a pioneer in the sport of freestyle skiing and welcomes skiers of all levels for a customizable full mountain experience. Trace was a member of both the 1992 U.S. Olympic team in France and the 1994 U.S. Olympic team in Norway. He competed in freestyle aerials at both Olympics, as well as mogul skiing in 1994. Worthington has been featured in three Warren Miller films, four RAP production films, and numerous global commercials for VISA and Chevrolet. Chris Waddell is the winningest male Paralympic skier in history. He is also one of only a handful of athletes to win World Championships in both winter and summer sports. As a skier and a wheelchair racer, he always set his goals higher than just the top step of the podium. When he broke his back as a collegiate ski racer and then started to ski in a monoski, he realized that his performances gave a voice and an image to the disabled community, a largely forgotten segment of the population. In September of 2009 he became the first Paraplegic to summit Mt. Kilimanjaro. The summit of the tallest mountain in Africa and his One Revolution Foundation he’s attempting to affect a social change in how we see ourselves and other people. Through an average person achieving an extraordinary feat, he hopes that we can all access our genius. Shannon won a silver medal in mogul skiing here at Deer Valley Resort in the 2002 Winter Olympic Games. She became the first U.S. freestyle skier to win multiple Olympic medals with her bronze medal win at the 2010 Winter Olympic Games in Vancouver. She is a three-time Olympian, 2003 Overall World Cup Champion and six-time U.S. National Champion.